Essential Property Maintenance is a full service lawn care and lawn mowing company based out of Calgary AB. We specialize in mowing all sizes of lawns on all types of properties including private residential, townhomes and homeowner associations and commercial property mowing. 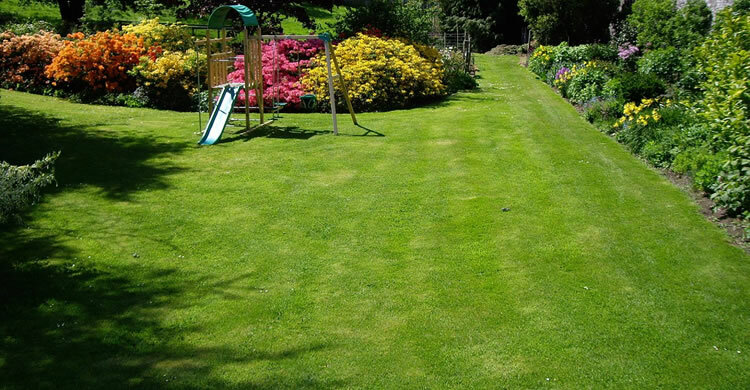 If you have a high visibility property and want your lawn to look its best, our team of professionals can help! Schedule Your FREE Calgary Lawn Mowing Services Estimate Today! For many homeowners or commercial property owners with a large lawn and high visibility grassy areas, the time required to mow and maintain it to a high standard is just too much work. Maybe you are just fed up with the poor quality mowing job your current provider is doing and you are looking for a change? We’d be happy to take the hassle of mowing and maintaining your lawn off your hands! Whether you’d like a weekly or bi-weekly mowing program (depending on the weather usually) or a one-time cut of a neglected lawn that has grown to be waist high our team can provide you with the mowing solutions to keep your property looking fantastic and well cared for. We are a team of seasoned professionals, ready to jump into action! Townhomes, Condos, Stratas and HOA’s. Trimming around lawn and garden edges. Blowing out beds of any clippings. Disposal of all grass clippings. Visual inspection of your property. We’ve mowed thousands of yards throughout Calgary and we’ve streamlined our mowing processes to cause minimal hassle or inconvenience for the property owner. We can custom tailor your lawn mowing and maintenance package to ensure your residential property, estate or commercial property gets the specific attention it needs on a regular basis. We will listen to your requirements. We’ll provide you with a competitive estimate in writing. We show up on the scheduled day(s) and mow and maintain your lawn as promised.